In this DIY guide our experts offer help and advice with how to fit trickle vents into windows and doors in the home to help air flow and avoid problems with damp. Fitting trickle vents to your UPVC windows and doors can also help to prevent condensation that contributes to mould growth that could be harmful to your health and damage your home. A property or building that does not have sufficient ventilation is a building waiting for condensation problems to occur. The most obvious sign of condensation problems due to no trickle vents is condensation around the internal, head and sides(reveals) of window frames. These problems will normally manifest themselves in the form of damp wall or ceiling areas with the surface area turning black with the growth of mould spores. To remedy these issues, this project will now run you through the steps of how to fit trickle vents to your windows and doors to prevent the previously stated issues. Bad or stale air is not good for you or your children to continuously breathe in. You will find that wallpapers, carpets and other materials will start to feel damp by absorbing the moisture held in the air within the property. Improving the air flow will remove these problems from your property. See our projects on condensation. 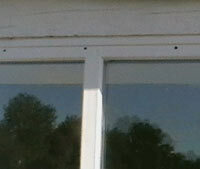 Installing or fitting trickle vents in your doors and windows is an easy and safe way of dealing with the problem. The hot air gathers inside your home and gravitates towards the cooler surfaces. These are often windows and doors. The windows and doors are usually in a recesses so the warm air is trapped. It rises to the head of the window or door where (if there is an open trickle vent) it can escape. This is a very simple procedure. Firstly you will need to purchase your chosen trickle vent. 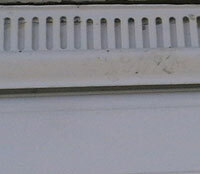 If you are cutting in one vent at the top of your window/door you will need to firstly mark a level line across the position you want it to sit. The window shown in the image below is an office window and a continuous trickle vent is being placed on the frame. This is a grid vent which cannot be closed so the owners of the building know that the rooms are being continuously vented. Mark a centre point on that line, if you are installing lets say a 400mm by 30mm trickle vent, you will firstly need to measure 170mm each way from the centre point you have marked. Next, you will have to drill a small pilot hole at each end of the 170mm mark through the window. This will allow you to repeat the procedure on the inside of your window making sure the holes cut to create your trickle vent match up. Next, you will need a 20mm wood bit for wooden windows or a high speed bit for PVCu windows. Lets say your window frame is 50mm thick. Get some insulation tape and mark a depth on the drill bit of 25mm. 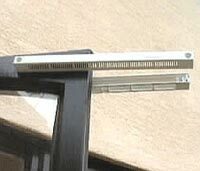 When drilling PVCu windows you will need to use a high speed bit designed for drilling metal. All PVCu windows should have a metal reinforcing strip within the frame. This strip is not very thick and quite easy to drill through although we suggest using a smaller drill bit initially, then increasing to a larger bit for the actual ventilation holes. The smaller bit is essentially a pilot hole. Using one of your pilot holes as a starting guide, drill holes in the window frame to the depth marked on your drill bit with the insulation tape. Repeat this process along the centre line marked till you reach the pilot hole at the other end. Go inside and repeat this process, taking care when you reach your marked depth of cut. You will find that the drill bit will break through abruptly. Keep the drill level at all times to ensure the holes meet. Continue drilling and connecting your holes. Next, use a sharp chisel to clean up and then sand to remove any rough areas. Alternatively, to be absolutely sure your vent is operating at maximum efficiency, it is possible to remove a casement window and, using a router, you can rout out a groove for the vent. Lastly you can now fix the two sections of your trickle vent to the window frame, making sure you place the sections of your trickle vent to the correct side of window frame. They will be labeled internal section and external section and the small mesh, called an insect grill, always goes on the outside. Top job! You have now just learn’t how to fit trickle vents!